Secure Printing - jobs are only printed after the user arrives at the print area and confirms their identity. This ensures the user is present to collect their job and other users can't "accidentally" collect the document. Approved Printing - some organizations may wish to hold jobs until they have been approved. A good example would be a teacher approving printing to an expensive color printer. PaperCut provides the framework and software interface to implement hold/release queues. Print Release Stations provide an interface to allow authorized persons to release held jobs. Often a release station is a dedicated PC terminal located next to the printers, however release stations can take other forms such as a web browser based interface. For more detailed information about various release station usage scenarios, or information about installing and configuring release stations, see the online user manual. 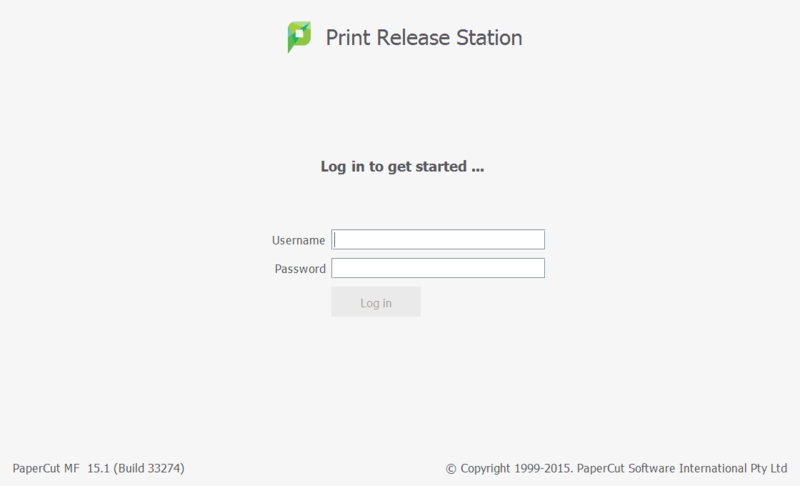 Print release stations make an ideal companion to PaperCut's find me printing feature. See the Find Me Printing tour section for details. The look of the release station may also be customized to suit your organization. See the Customizable tour section for an example. Hold/release queues may also be used without any print release stations. For example, a classroom may have a color printer that requires teacher permission to use. A hold/release queue may be configured on the printer so that jobs wait for teacher approval before printing. The teacher may access a simple URL like http://print-server:9191/release and approve or cancel any pending jobs.